This is how I roll at networking events! I have a love/hate relationship with networking events. While I absolutely love meeting new interesting people, I absolutely hate starting the conversations. I’m kind of a shy person and I’ve just never been very comfortable going up to strangers. So if you’re reading this and you’re a socially awkward weirdo like me, here’s a good trick I’ve learned over the years on how to get the most out of networking events. Flip the situation on it’s head: instead of forcing yourself to awkwardly go up to strangers and start conversations, give strangers a reason to start a conversation with you. The best way to do this is to go to networking events where there is a live speaker or a panel discussion, and then ask a well-thought-out question during the Q and A. *Okay, maybe not mountains of gold, but if you follow up with this person via email or a written thank you note, at the minimum you will be on their radar and have an entry point for keeping the conversation going. Untutored, I did this last night. Two people introduced themselves to me. Separately, having learned the nature of the newly met person’s business, I often ask, “What was the highlight of the year so far?” Who doesn’t love to brag about the great deal or project? This gives me a chance to hear more about their organization and learn whether or not there are ways to work together. Ethan, I’d rather just wear the shirt. 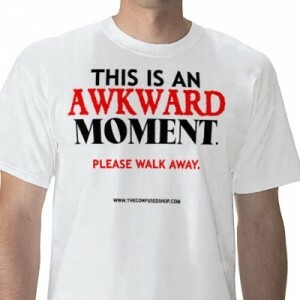 Please send one to me, and I will wear it to all future networking events. Thanks! Yes, good point. I’ve always found it more useful to listen than to talk. Ethan – How fun since this is how we met! So true. We met Susan who is one of our closest advisors and friends through a networking event at the Coleman Center in Chicago. The Coleman Center was hosting a group discussion on marketing. We took the opportunity to spotlight GiveForward by asking a question to the group about how we could improve our marketing efforts. For the next 20 minutes we had 50 smart people learning about GiveForward and thinking about our company and how to improve it. One of those smart people was Susan. This is the poor-man’s version of “peakcocking” with pick-up artists. I’d rather go to the absolute limit and just wear a giant top-hat and suspenders until the ladies (CEOs) are forced to chat with me. Thanks. I’ll try the top hat approach at my next networking event. You know, like a real aristocrat.